For any document management software or file management application to be truly adopted in any environment it has to ensure that its users can easily access files in it and perform documents filing from anywhere on their computers. Docsvault understands this fact very well and provides windows explorer integration at many points. Apart from common copy & paste, drag & drop, PDF printer and MS Office integration methods, Docsvault is also integrated into Windows Explorer Open and Save dialogs. 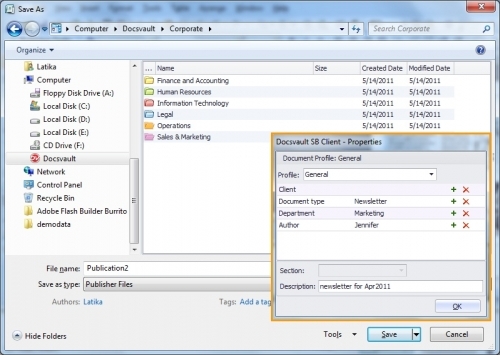 This allows users to open and save files in Docsvault from any application using a method they already know. Docsvault is also available under file and folder right click context menu which makes saving files into Docsvault from anywhere a snap. Tight integration with Windows ensures that users don’t waste their time on mundane activities like saving and importing. Open/Save and drag/drop functionalities make it easy for users to adopt Docsvault in their day to day activities. Use Active Directory Integration and access the documents contained within the repository using Windows login and password. To Save, share, review and manage all Word, Excel and PowerPoint files as well as Outlook emails. Docsvault is integrated with MS Office, Windows Explorer, Active Directory and Third Party Applications thus making work seamless and less time consuming.